Posted By PA Breast Cancer Coalition on January 15th, 2015 at 10:26 am | 53 comments. Bo Peep’s Bonnets is the creative result of a Lancaster County daughter’s search for stylish hats for her mother to wear during her chemo treatment. Danielle (a.k.a. Bo Peep) decided to fill the need she saw for winter hats by using her own knitting skills to come up with beautiful hats designs. 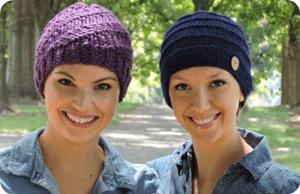 Now, several years later, Bo Peep’s Bonnets offers a free hat to any woman experiencing hair loss through chemotherapy treatments. How can you apply? Simply fill out the request: http://bopeepsbonnets.com/handknitsforhope/ You even get to choose from a dozen different designs!